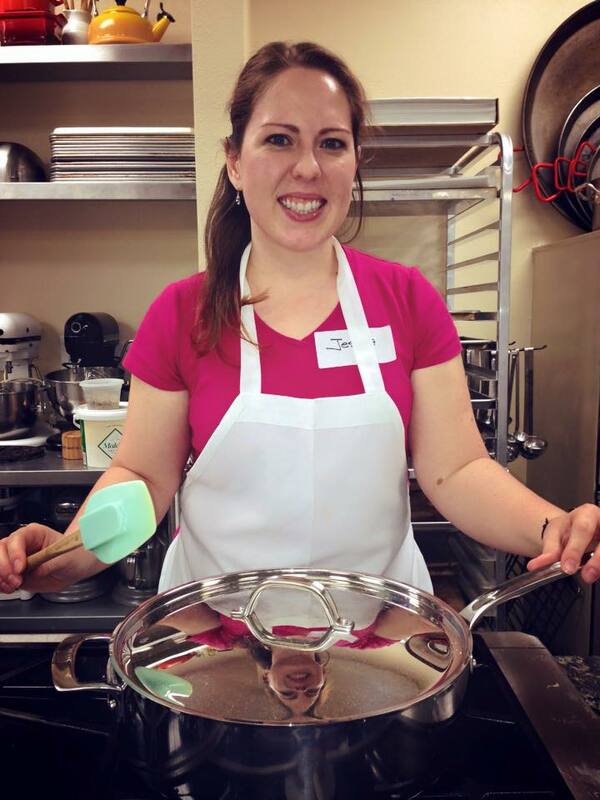 For months, I searched the online class schedule for a course that would make me look like a goddess in the kitchen. From specialty lectures with famous chefs to series of courses where you could learn basic skills or hone your baking, the selection was huge! I knew I wanted a hands-on class rather than a lecture so that helped narrow things down. There were so many fun nights to choose from. How about making paella or learning the intricacies of French macarons or slapping together a variety of grilled cheese sandwiches? There were a lot of classes I wanted to take that were either full or didn’t accommodate my schedule. 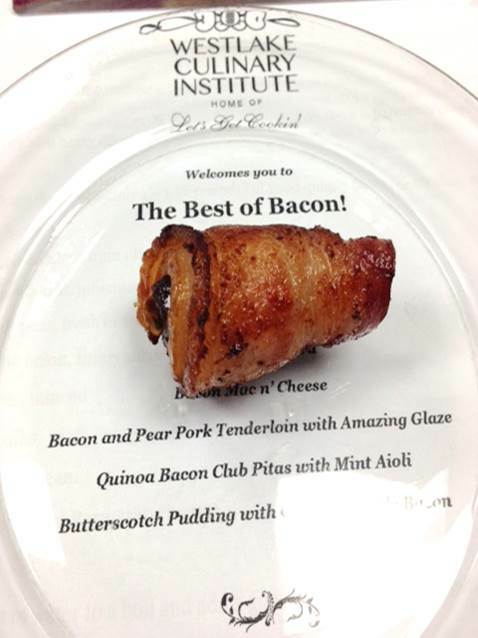 Until one fateful night when I found the perfect class: The Best of Bacon. I was thrilled. 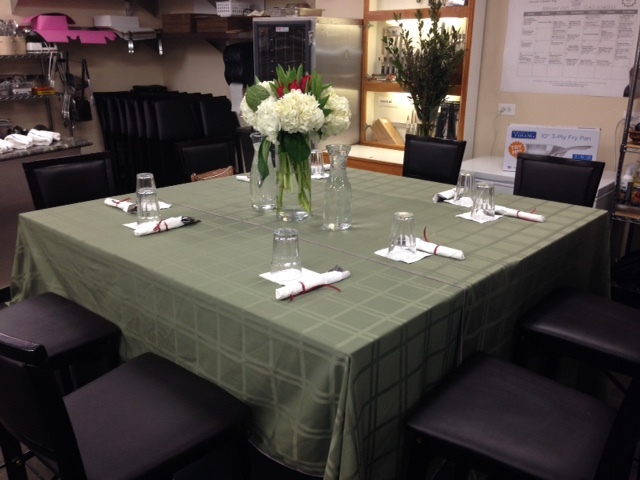 Not only did the course menu look amazing, but the class wasn’t full (shocking!) and it fit my schedule. I called immediately and made my reservation for the Tuesday evening class. I’ll be on the Food Network before you know it. When I walked in, I knew I was in trouble. Not only was the cooking area adorable and the employees completely friendly, but it was a store. 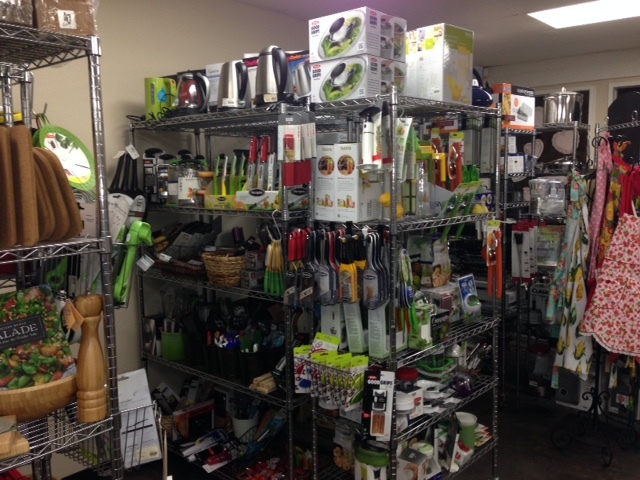 That’s right, a store with every kind of cooking gadget, spice, and cookbook you could possibly think of. 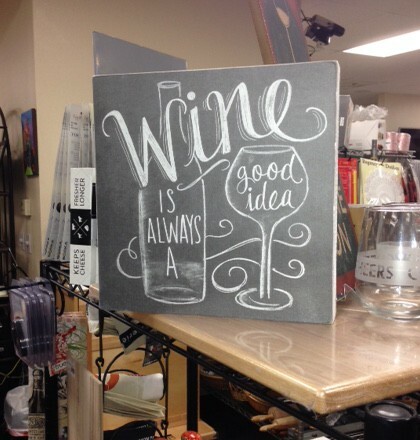 I knew I wouldn’t be leaving the class empty-handed and I certainly didn’t. For a class devoted to the most beloved breakfast meat of all time, I was surprised to see that there were only eight of us there to learn. I loved the intimate class size because we got to know one another, poking fun at each other as the night went on and it was like cooking with old friends rather than people I had just met. I was the only one that was alone, but it didn’t bother me in the least and I made plenty of new friends. As the class got started, our palates were teased with a bacon-wrapped date appetizer to what would end up being the most delicious dinner. Chef Mike Clarke led the group through the evening’s events. We ran through the menu and were told to pick the dish(es) we wanted to work on. 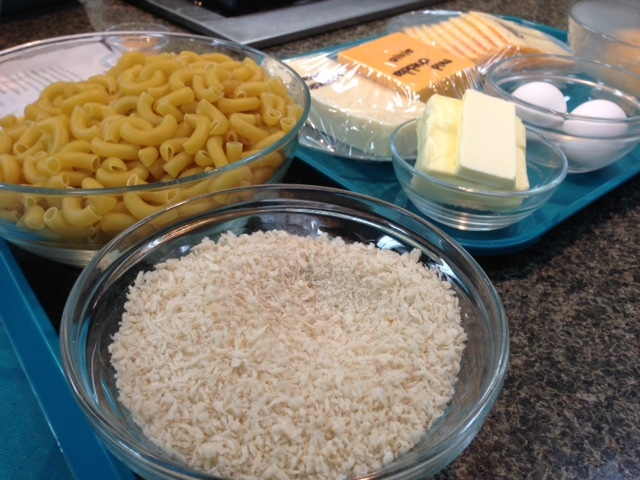 After tying my apron and washing my hands, I was drawn to the perfect place: the macaroni and cheese station. Mac n’ cheese and I go way back. It was the first thing I ever learned how to cook and I think it’s because my family got sick and tired of making it for me. I could eat Kraft boxed dinners with their powdered cheese for breakfast, lunch, and dinner. Sometimes with chopped up hot dogs thrown in, sometimes just plain. Needless to say, we have a history. 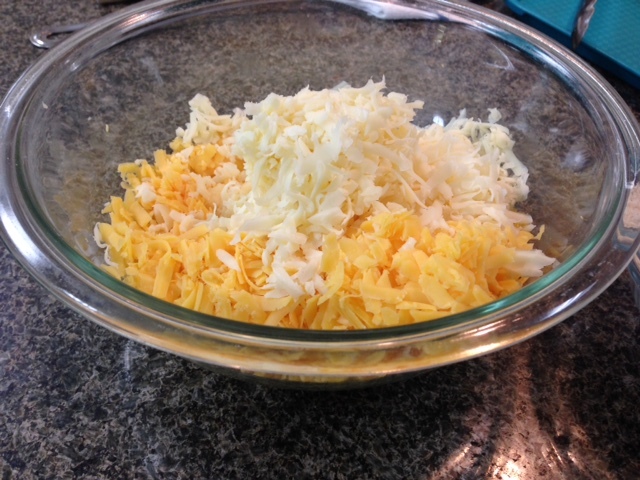 Working with two other ladies, we got the pot of water on the stove and set about grating three different types of cheese. Somehow, I managed not to sneak a single piece. 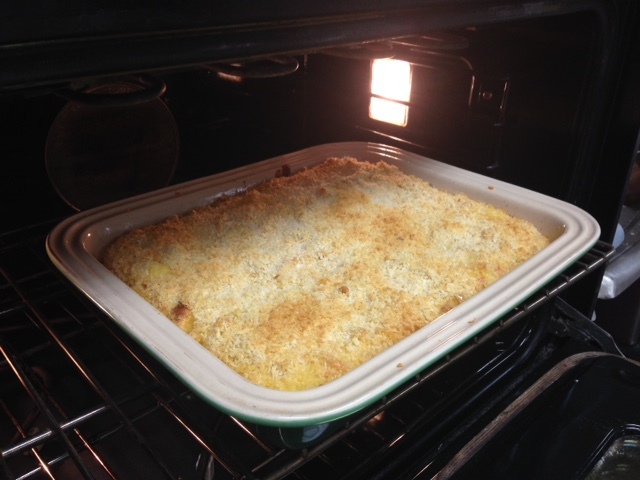 Since it was a class all about bacon, we added a few strips to our cheesy noodles, topped the whole thing with Panko breadcrumbs and popped the casserole dish in the oven for proper melting and browning. 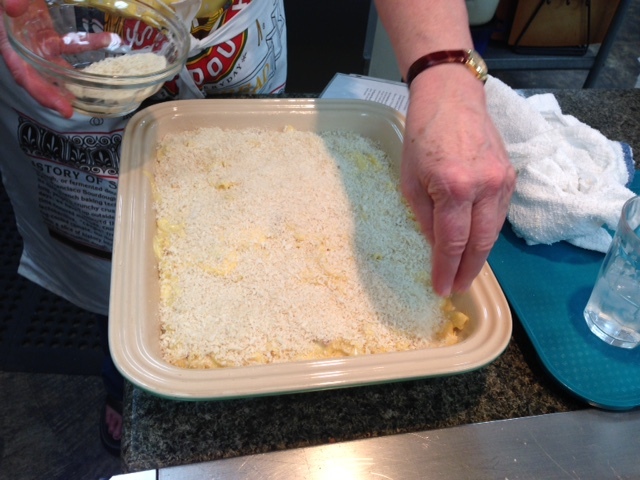 The Panko gives the dish the perfect bit of crunch. With our dish out of the way, we got to see what the rest of the class was up to. The entire kitchen smelled like Porky Pig on a spit and it took all the strength in the world not to grab a little piece of everything. 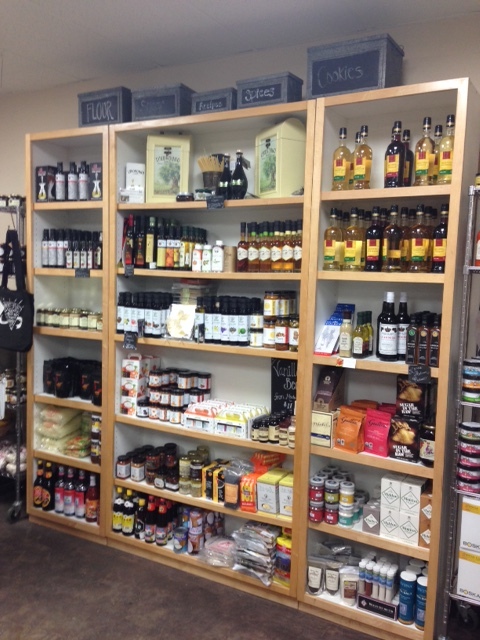 As the dishes cooked, we had some time to browse the store and sample some of the items. 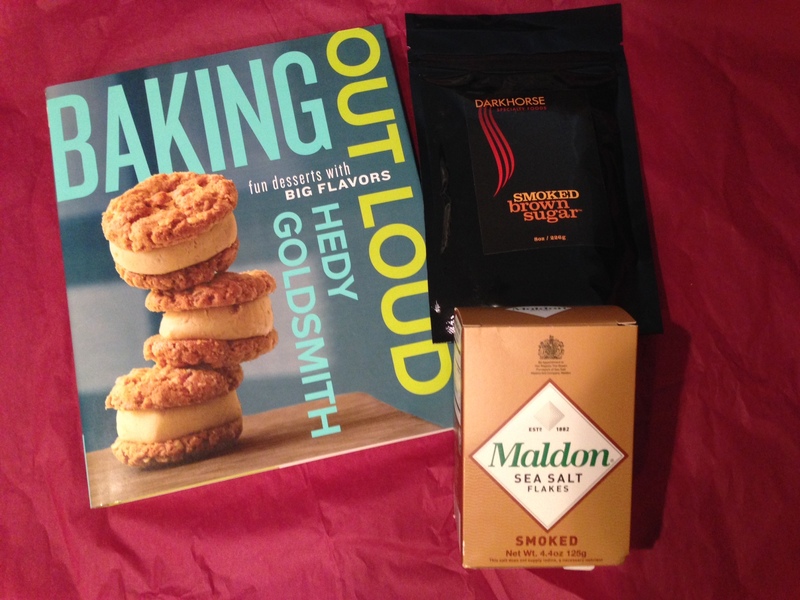 If you’ve never had Maldon flaked sea salt or smoked brown sugar, you don’t know what you’re missing. And I’m not even that much of a salt person. Eventually, the timers went off and it was time for dinner. After each dish’s creators served up their offering, the courses were delivered to the table one by one. Each one more scrumptious than the last, especially with a glass of wine to wash it all down. 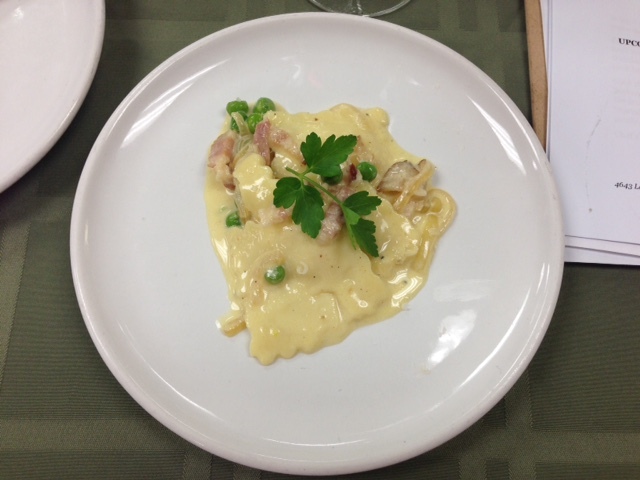 The carbonara sauce was creamy, yet light and not heavy. 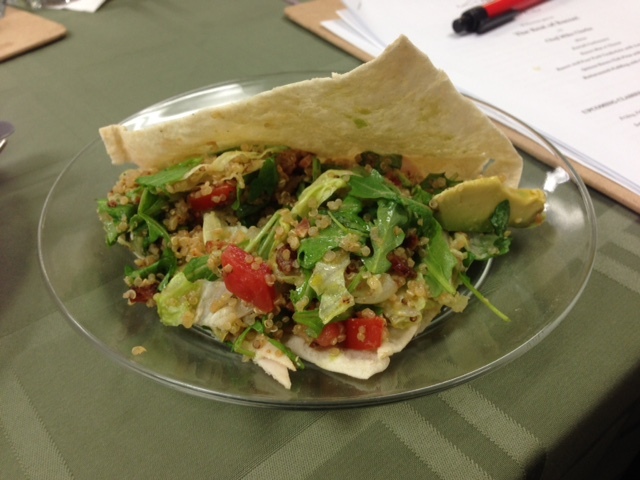 The bacon quinoa club would make a perfect salad without the pita. 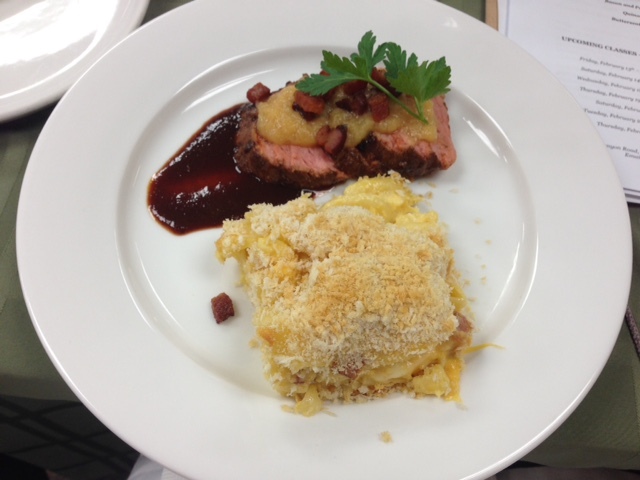 The pork tenderloin with pear essence and Amazing Glaze was mind-boggling. 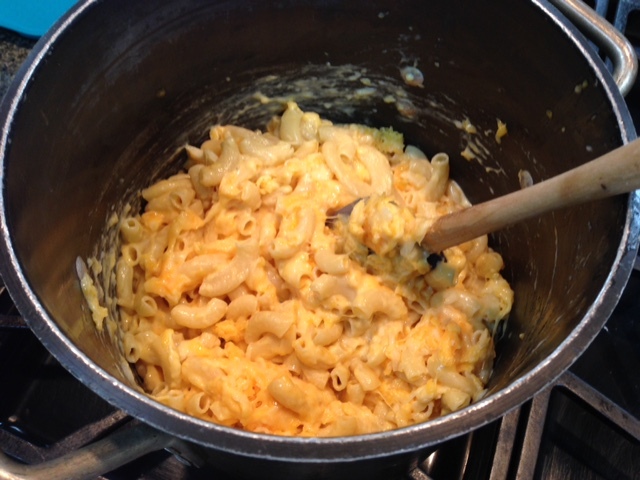 And our mac ‘n cheese, a big hit. The dinner was absolutely phenomenal and I have added the recipes to my collection (which is almost done being organized). And then came dessert. 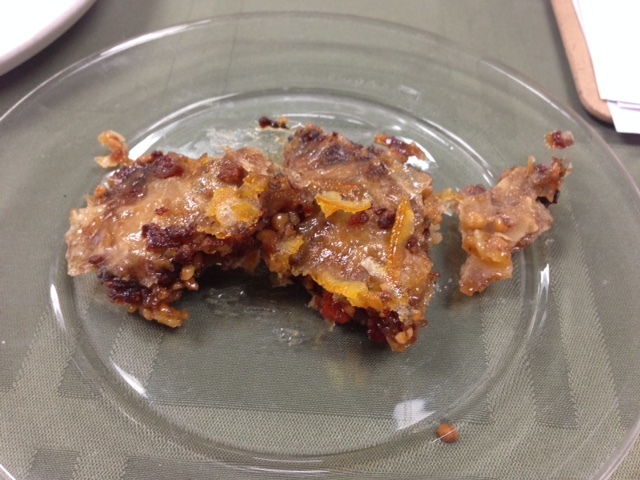 Not only did we have butterscotch pudding with candied maple bacon, but the owner of the shop even made us bacon baklava. Now, I’m not a particularly big fan of the ultra rich Turkish pastry, but this was awesome! 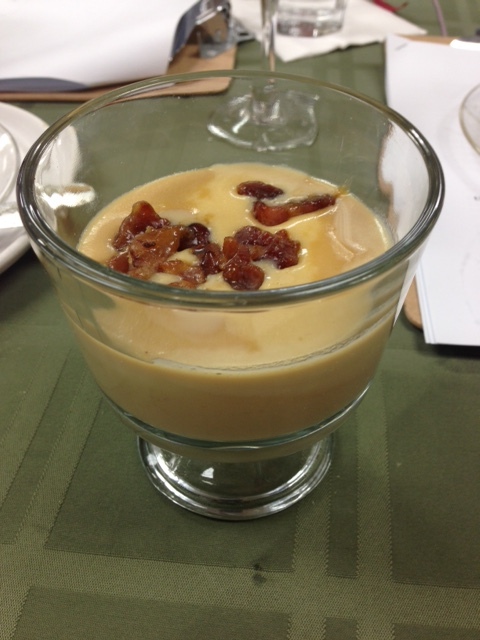 The orange flavor at the end was an unexpected and welcome juxtaposition to the bacon and honey. 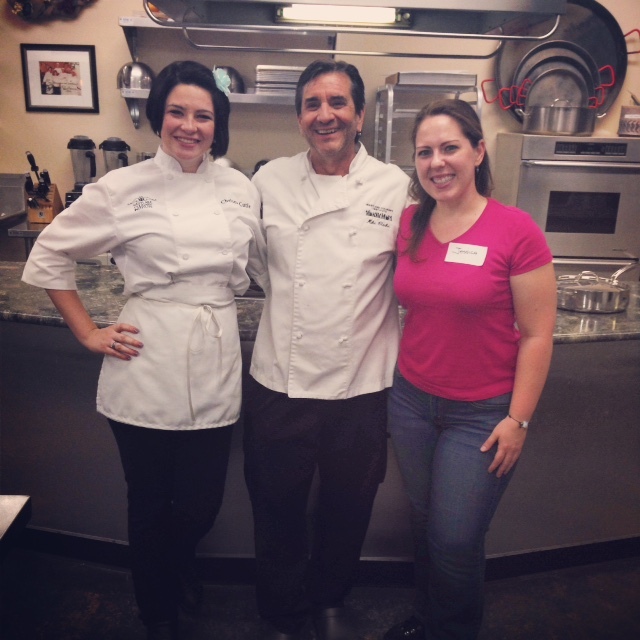 Chelsea and Chef Mike made the night so much fun! It was almost 10pm when I finally left, completely stuffed and eager to try out these new dishes on unsuspecting friends and family. I couldn’t have asked for a more fun or perfect way to spend an evening. The store was stocked, the staff was awesome, and the experience was one I’d gladly do again and again. But next time, I’m coming super hungry. I have a ton of delicious recipes on my blog. Take a look and let me know what you think. Bacon is a beautiful thing. Thanks for stopping by, Ema! Hey Jessica, what’s up? I love sweet bacon. How fun! I love cooking when I have time for it, but I’m not super adventurous. I went to a class like this once and it was so fun. Mine was all about gluten free cooking. Tobi, it was so much fun! And everything was so delicious. They have so many different types of classes, but at $85 a piece, it’s not something I’ll be doing as often as I’d like to. OMG I a drooling. What an exciting thing to win!! I love the pictures and the recipes. I’ve made bacon wrapped dates before and they were the hit of my holiday party. 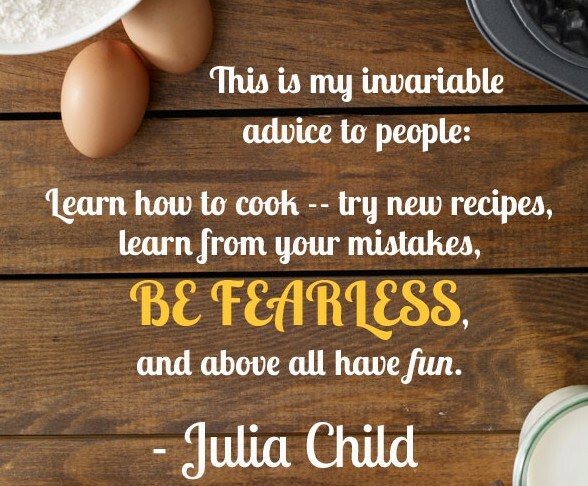 Any time you want to send recipes my way – do it! Especially those involving bacon. I always dip my bacon in my maple syrup when I eat it with pancakes. Yum. 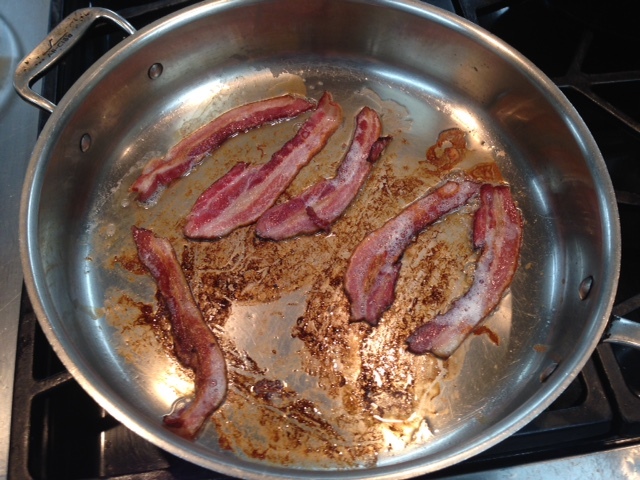 Patricia, I was drooling the minute I walked in and didn’t stop until I was home and could no longer smell bacon. I’d never had a bacon-wrapped date, but it was delectable! Thanks. I’m looking forward to more bacon deliciousness. Whoa. How fun is this?! Next time I’ll man the bacon-infused booze station (and totally not steal cheese when no one’s looking)! P.S. – Okay. I gotta say it. Quinoa at a bacon-centric cook-off? Really? Bacon booze would have been the perfect addition to the evening, Jules! About the quinoa, I’m with you. While it was good, it wasn’t my favorite dish of the night. However, the mint aioli was pretty darn amazing.